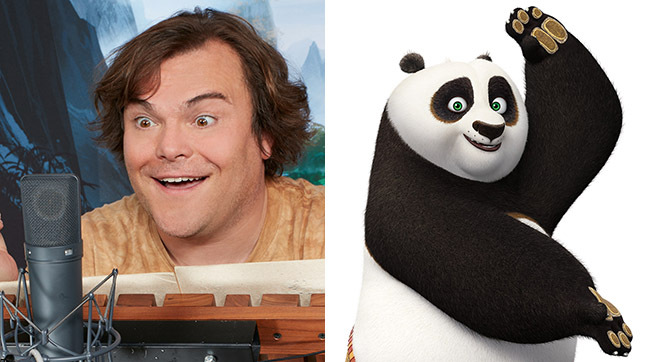 Sparring with Jack Black, Star of "Kung Fu Panda 3"
When most people hear the name Jack Black, they think of his ability to make people laugh. He has starred in a number of super entertaining films, including Goosebumps, Nacho Libre, and School of Rock, just to name a few. His latest movie, Kung Fu Panda 3, hits theaters January ##, and finds his character, Po, reuniting with his long-lost father. Kid Reporter Ryan Woon chatted with the sports fan about bringing Po to life and his own kung fu abilities. This is your third time playing Po. How do you keep the character fresh and fun? Well you know, it is always fun to be in the recording studio laying down tracks for Po. He is a fun character no matter how many times you played him. He loves kung fu, what’s more fun than that? There is a new script, a new story, new challenges – it was easy! Do you have to do anything to get in the mindset to play Po? Do you do kung fu warmups? I don’t do kung fu warmups before recording. But I do work with the director who has a bunch of art for me to look at to see what the scene is going to look like, basically, and I just think about the situation Po is in and then pretend like it’s real. It’s very simple really. When you’re in the recording booth, how into character do you get? Are you throwing kicks and fists and acting out what Po’s doing on screen? When I am recording, I do get physical. If my character is doing kung fu, then I like to do kung fu, too, just to make it sound realistic. Because if you are just standing still while your character is doing kung fu on the screen, it doesn’t sound real and you can tell. I am a Method actor, so I want it all to sound really real. Po is awesome at kung fu. How good are you at kung fu? I am just all right. I wish I were a kung fu master. I’d be in better shape. It’s hard to find a good kung fu master, though, to teach you. There are not very many of them in the world. Not real kung fu. There are a lot of pretenders, but only a handful of masters. How much of you is there in Po? And how much of Po is there in you? You know, Po is like a younger version of me. He’s me like when I was 16 years old I’d say, or maybe 14. So, I think back to my childhood when I am doing it. And so I am going to say 25%. Who are your kung fu idols? You gotta go with Bruce Lee. He’s the first megastar kung fu master. And he wasn’t just an actor, you know. He was a real kung fu champion. But I also really like Jackie Chan. He’s awesome. He’s been doing it for 40 years – it’s impossible. He’s been doing kung fu movies longer than Kobe’s been in basketball. Jackie Chan is part of the Kung Fu Panda series. What tips or advice has he given you, either for Po’s character or your own kung fu? You know what’s crazy? This is the third Kung Fu Panda movie and I have still not met Jackie Chan. Impossible right? But not impossible, because when we go into record we go in alone and they put our voices together for the movie. If we ever do meet, I will have many questions for Jackie! First, I’d ask him why did he steal my name? And then I’d ask him, What is his secret to his long, long career? What does he eat for breakfast? That’s what I’d ask him. What advice would you give kids who want to be an actor like you someday? I always tell kids if they want to be an actor, they should start writing, you know, to make movies yourself on an iPhone or iPad or whatever you can get your hands on. It’s important to know how to tell a story on camera. You need to make movies for yourself, because if you are just going on auditions to wait for someone to put you in their movie you may never really get the experience you need. How about if any kids want to do kung fu? First, you have to find a master. You could start with Google. I did some Jjdo when I was a kid – it was hard, but it was a fun thing to learn. I recommend it. Are you as awesome as Po with chopsticks? I am very good at chopsticks. I would love to go head to head vs. Po in a chopstick battle. Um, that’s one of those things we’ll never really know. Will Golden State lose any games this year? Will they break the Chicago Bulls record of 72 wins? At some point – not yet. Maybe. Will they break the Lakers’ 33 wins in a row record from ‘71? They won’t break the record, but they’ll win two or three more for sure. I am asking you some impossible questions ‘cause there is no real answer, just opinion. Who’s your favorite player in the NBA? Absolutely. Right answer. Who’s your favorite soccer player? Right, not Beckham. Is he even playing soccer anymore? I think he is retired. Right. He is like the Kobe Bryant of soccer, but more like the Michael Jordan probably. Do you think Carolina will go undefeated in football this season? It’s unlikely, but that would be amazing. I am rooting for them. I am rooting for them, just so they can shut up those Miami Dolphins. I am tired of their yacking about how great they are. NBA basketball. I am Laker for life, even though they are the second worst team in the NBA right now. Laker for life. Basketball is cool because you never know what is going to happen next. Totally. I do kind of feel like it is going to be the Golden State Warriors vs. the Cleveland Cavaliers again. I kind of feel like I know that is going to happen. The rematch. In football I am kind of rooting for the Seahawks. I am rooting for the 49ers. Of course. Who’s the quarterback? Blaine Gabbert. He’s doing pretty well. Solid. They have had a lot of shakeups in the last few months. No more Colin Kaepernick? Lots of changes. Um, I don’t have any more questions. I think we did well. That’s a good interview. I think you did a good job. Of course. Good to meet you. Any time!